A photographic wall mural is a fool-proof way to visually carry someone away to another space. Whether you're trying to achieve a very literal representation as above, or something more obtuse, a custom wall mural is not just aesthetically pleasing, but transportive as well. The custom wallpaper project above was produced for the Chicago Grill. The mural features the skyline of Chicago, as photographed from Lake Michigan. You can almost get a sense of the wind sweeping across the water toward the marina and the skyscrapers beyond. 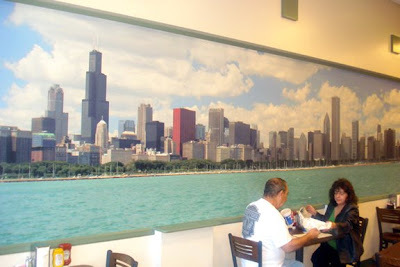 The wallpaper image itself is effective, and truly evokes the essence of Chicago; quite important when you realize that the Chicago Grill is in Lake Havasu City, AZ, thousands of miles away from the windy city. We produced this mural for them in time for their grand opening of their new restaurant. The owners wanted to utilize the custom wall mural to transport their diners from the warm and clam of the desert climate, to the hustle and bustle of Chicago; so their customers could actually feel like they were eating at an authentic diner in downtown Chicago. The wallpaper mural stretches along one full side of the restaurant, giving the photograph plenty of room to create an awe-inspiring atmosphere. Truly, when you can't be there with the real thing, a custom wall mural will get you there as closely and cost-effectively as possible. Ready to take your guests or clients to an unexpected visual destination? Contact us to begin your custom wallpaper project.